17 & 19. 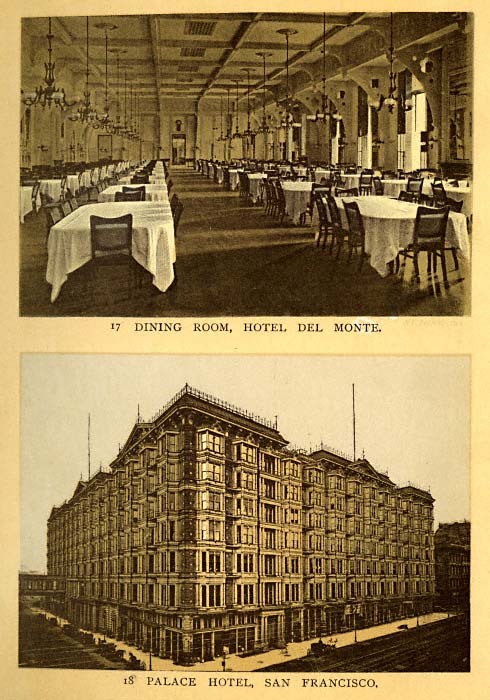 HOTEL DEL MONTE. (On Monterey Bay.) The name "Hotel del Monte" is now synonymous with whatsoever things are lovely, comfortable, home-like, and elegant. All that money, good taste, and experience can do toward making a perfect seaside resort, has been done here. It should also be observed that Nature had evidently anticipated some such idea, for she carved the hillsides, and crowned them with forests ; she rounded the bay-shore lines and smoothed out the beach; she planted mighty oaks and majestic pines, and attended to all the other small yet beautiful details; and everything being so favorable, it is not wonderful that this should now be a world-famous resort. Space forbids any particulars here regarding the management or accommodations of this mammoth hotel, or of its many attractions. Suffice it to say that all the necessities and luxuries of living are to be had at its table: all the comforts and conveniences of home are to be had in its parlors and grand suites ; all manners of recreations and amusements are to be found upon its spacious grounds; all sorts and kinds of shrubs and flowers are to be found bordering its grassy lawns ; cool, shady retreats abound, and retired walks down toward the lake, and over all an atmosphere balmy, bracing, and beneficent. And mark you, gentle traveller (an item not so poetical as practical), a man does not need to be a plumber or a bloated bondholder to afford the luxury of staying over night at this place  the rates are exceedingly moderate. Three and a half hours' travel from San Francisco, through the choicest and most beautiful of California's valleys, brings you to Del Monte, and no one can afford not to go who is visiting this coast, and wishes to enjoy its best things. 18. PALACE HOTEL, SAN FRANCISCO. The Palace Hotel, San Francisco, occupying an entire block, "or nearly two and a quarter acres," is one of the most striking features of San Francisco. It contains 750 rooms, reserved exclusively for guests. Standing in the courtyard, in which is ample room for a considerable number of carriages, and looking upward, the visitor will notice the balconies of the seven lofty stones, the immense glass roof, beneath which are graceful urns and vases containing tropical plants in luxuriant growth.